This bronze of a kilted Highlander stands in a small garden beside the main road (A949) into Dornoch from the A9. 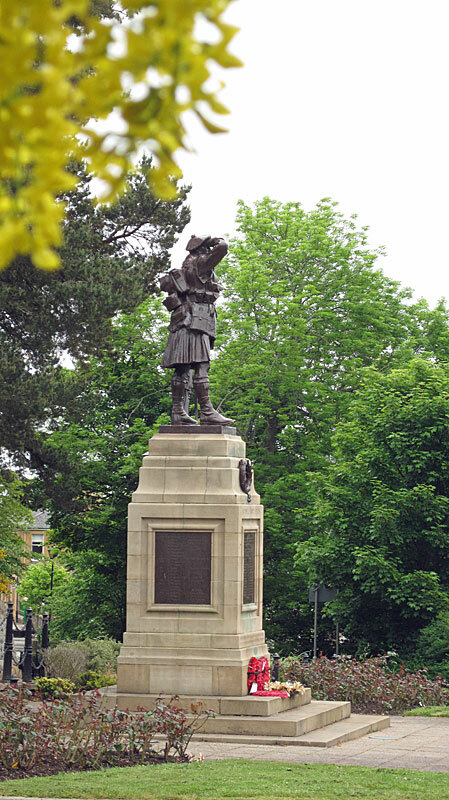 The figure is by the acclaimed sculptor Alexander Carrick who was responsible for many fine war memorials including those at Oban, St Margaret`s Hope in Orkney and the William Wallace statue and components of the National War Memorial at Edinburgh Castle. The figure depicts a soldier of the 5th Seaforth Highlanders gazing over the battlefield at Beaumont Hamel during the Somme Offensive in 1916. 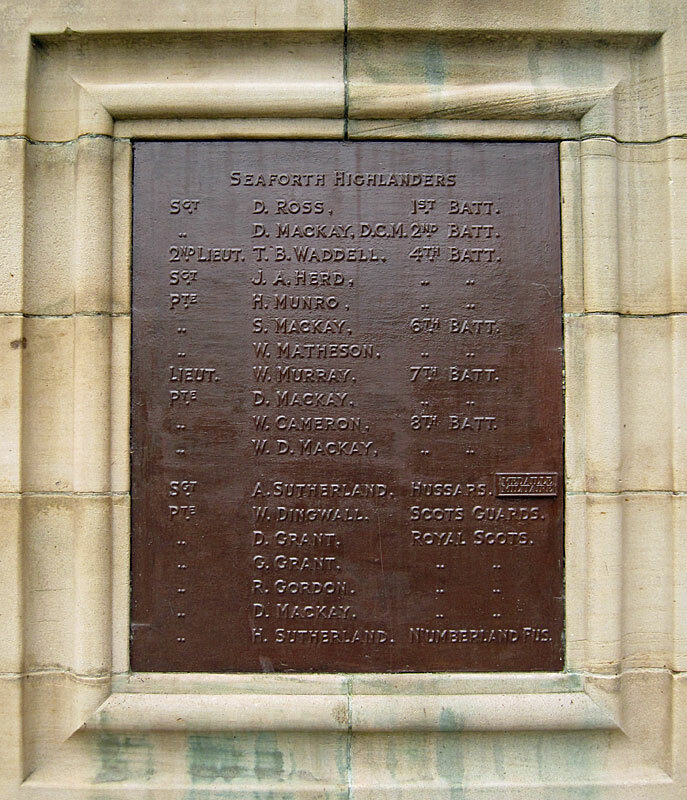 One panel on the Dornoch memorial`s plinth contains the names of local men from this regiment who fell. 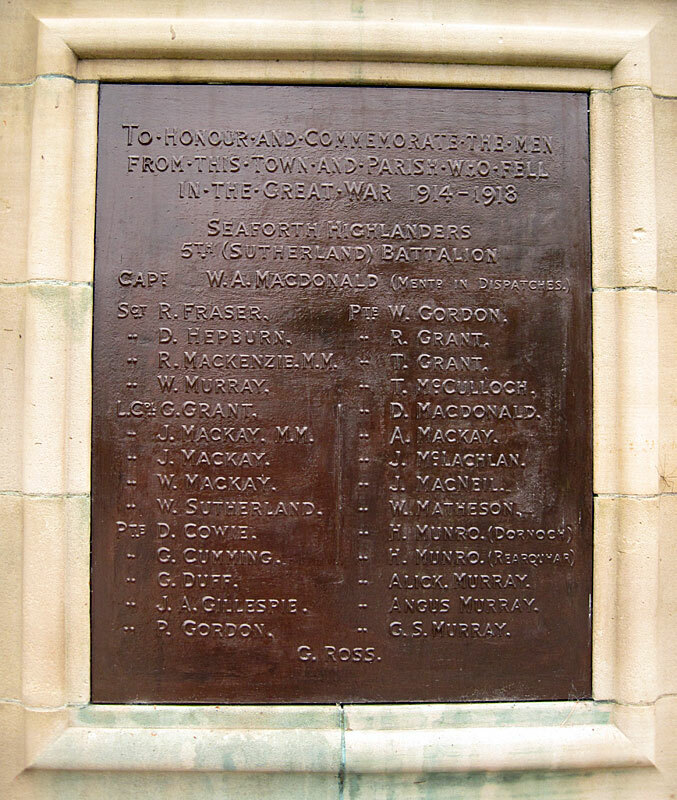 ​Other casualties from the Great War are named on another plaque. Please bear in mind that all my images are copyright. They are not free to use and have been embedded with a digital watermark. 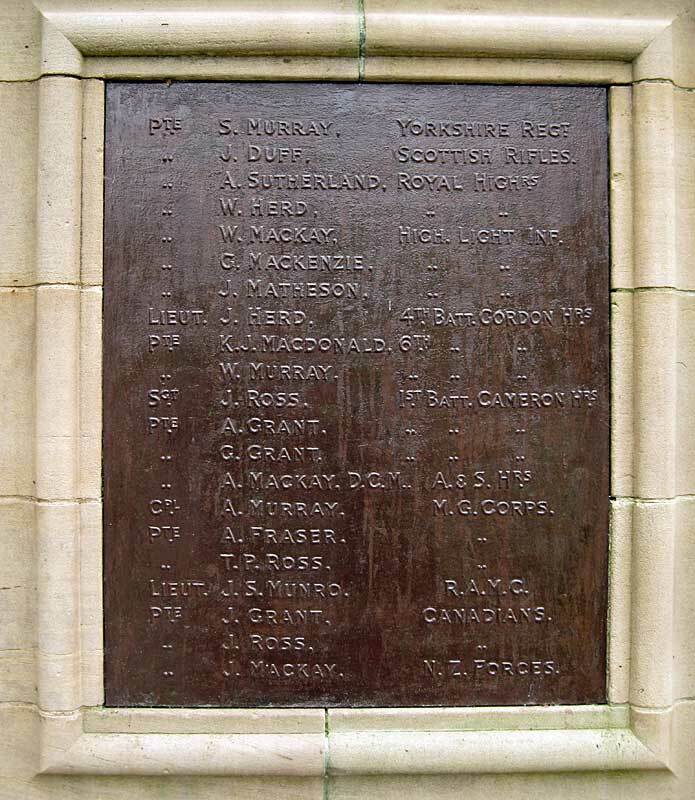 Second World War casualties include Lily Murray, a Nursing Sister. Golspie lies on the east coast of Sutherland, mid way between Loch Fleet and Brora on the main A9 road north. Like many coastal villages in Sutherland, the settlement began as a small fishing community which grew rapidly in the early nineteenth century to accommodate many of those evicted from the inland straths and glens during the clearances. Fishing became the established industry, but the opening of the railway in 1868 brought the first tourists to the area to enjoy the local beach and surrounding countryside. Although Golspie is a good base for exploring the surrounding area, most visitors merely pass through en route to the other towns of northeast Scotland such as Wick, Thurso and John o`Groats or the Orkney Islands. 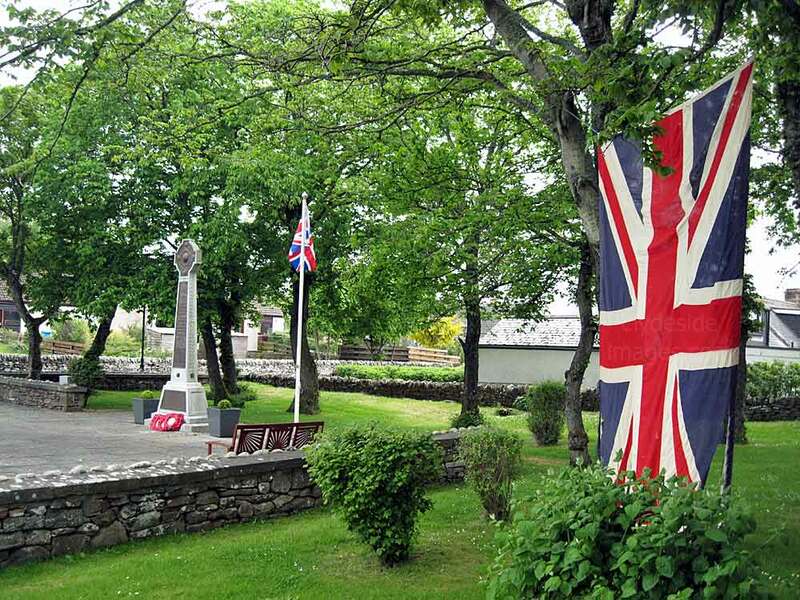 The Golspie War Memorial stands in a small but well-kept walled garden beside the main A9 route north. 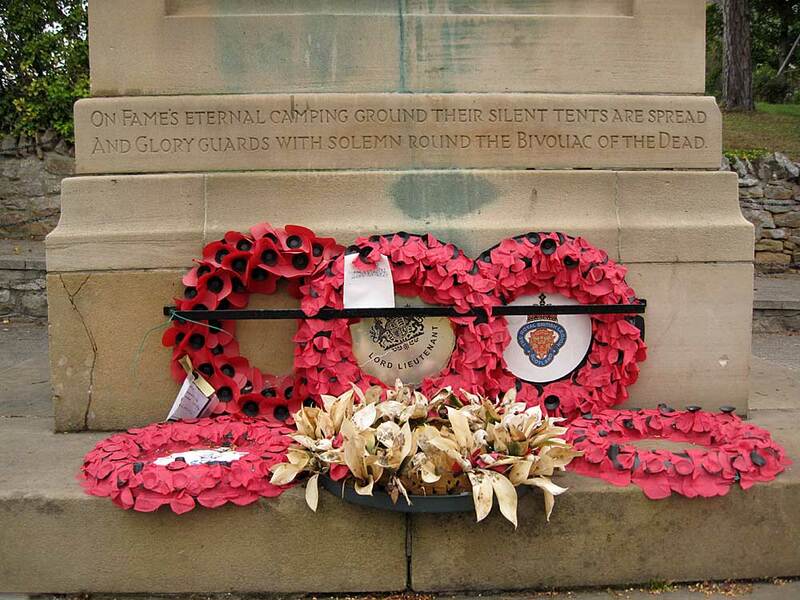 The memorial originally stood at the junction of Ferry Road and Station Road in the village but it was moved to it`s current, more prominent location in the 1970s. 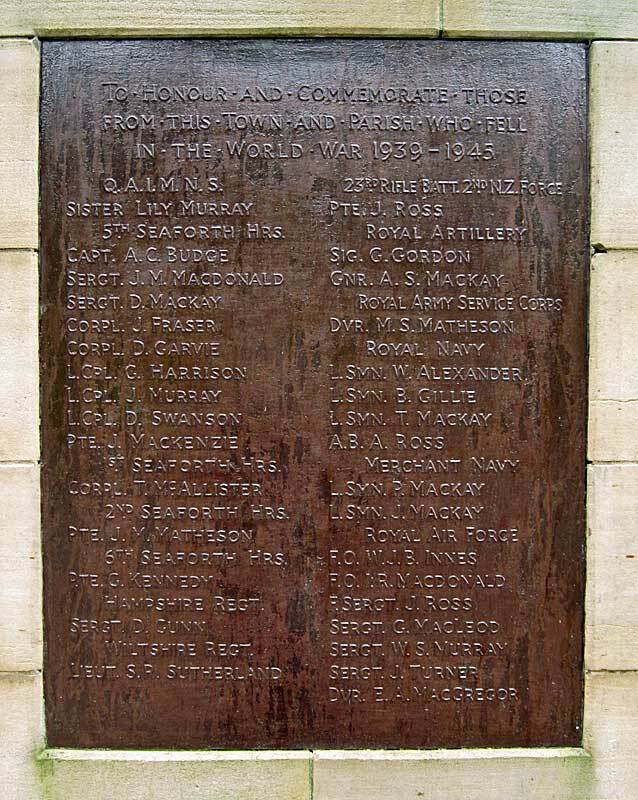 The memorial takes the form of a Celtic cross with a brass panel bearing a sword on the front and names of various Great War theatres of operation, namely France, Belgium, Egypt, Italy, Russia, Palestine, East Africa, Dardanelles, Mesopotamia and `At Sea` which are listed on a scroll running down the blade. 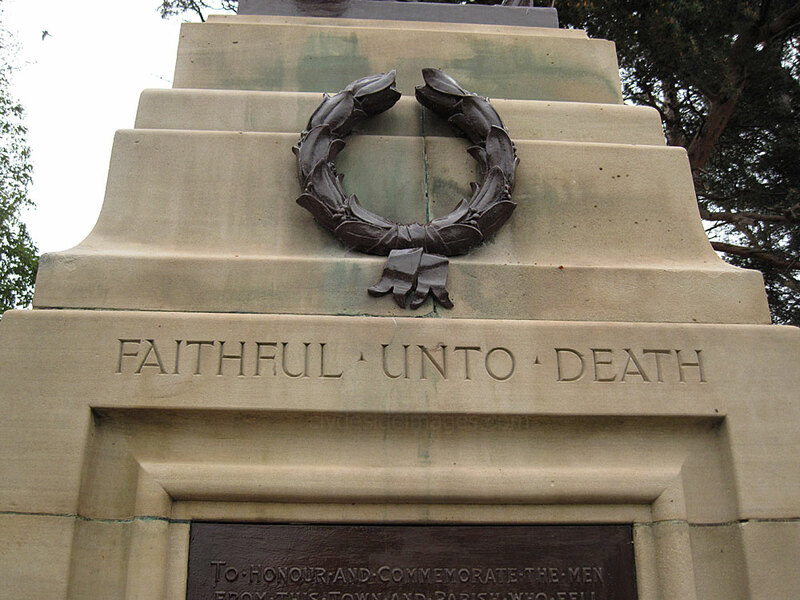 As well as commemorating the Fallen from the Great War (on the front) and World War 2 (on the rear), the caption also acknowledges `Those who suffered`. A flagpole flying the Union Jack stands beside the memorial and the additional, much larger flag, had been fixed to a nearby tree, possibly in connection with the Queen`s Diamond Jubilee celebrations during 2012 when these shots were taken.